develop, and their bites become serious for man and domestic animals. media they move rapidly and can conceal themselves quickly. of a single dog fly larva or pupa. animals at different locations along the coast. the occurrence of windrows of two species of bay grasses on nearby beaches. or turtle grass, the leaves of which are about the width of carpet grass. infestations of dog fly larvae and pupae. grass, wan placed near animals in a pasture, where it became infested. water, after which, on September 6, it was exposed for deposition of eggs. flies are present to deposit eggs. 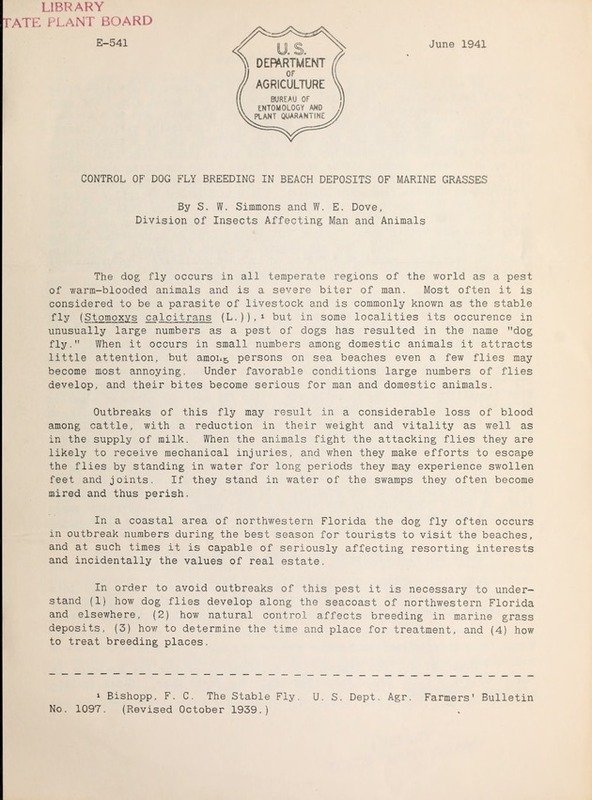 west coast of Florida under conditions prevailing in 1940.
sequence the production of flies in outbreak proportions would be expected. nto the water and served as a barrier against grass deposits on the beaches. by subsequent tides need be considered as potential breeders of flies. tides, thus making artificial treatment unnecessary. force themselves upward to the surface of the infested material.